The popularity of bestiary and fantastic beasts has increased in recent years; in line with the popularity of the Harry Potter series of books. Creatures such as the basilisk and hippogriff have been re-imagined from the Middle Ages, but few people will realise that many of these fantastic beasts have an earlier origin, with one such beast being the Manticore. One of the earliest mentions of the Manticore comes from the work titled Indica by Ctesias of Cnidus. Ctesias was a Greek historian and physician of the 5th century BC who was part of the Persian court of Artaxerxes II Mnemon. Ctesias would write a comprehensive history of Persia and the Persian Empire, but Indica was a work dealing with the Persian beliefs about India. Ctesias would tell of a man-eating beast the size of a lion with skin of bright red or scarlet. The fantastical nature of the beast though was not the size or colour of the animal, but for the fact that it possessed the face of a man and a tail similar to that of a scorpion. Three scorpion like stings could be found on the tail, and an additional one was located upon the head of the Manticore; each sting was over a foot in length. The poisonous nature of the stings was deadly to all whom they hit, aside from elephants. 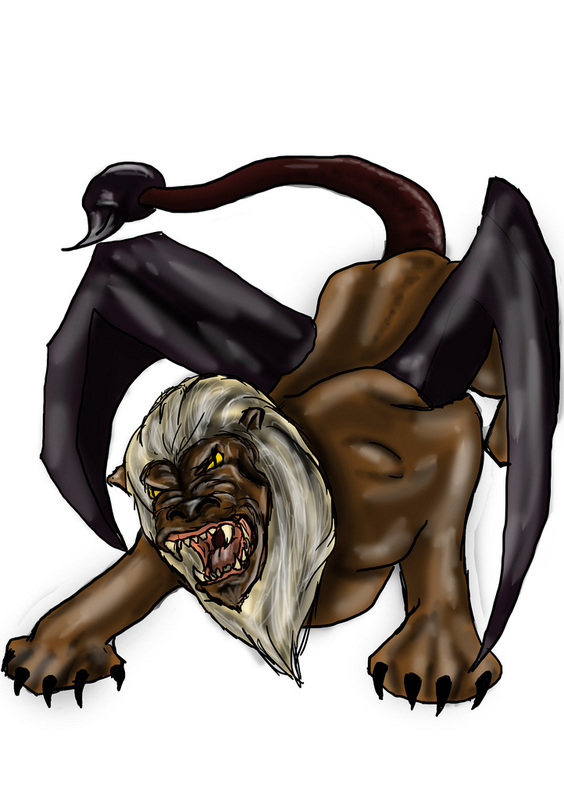 The stings on the tail could be unleashed like an arrow from a bow, so the Manticore was deadly from distant, but was also deadly at close range; the Manticore having the sting on its head lethal claws and also three rows of sharp teeth within its mouth. Manticores were said to eat a wide range of animals, including man, but little evidence of their kills would be found, for they would eat bones and all. The Roman historian, Pliny the Elder would also write in Naturalis Historia, of the Manticore having the ability to mimic the speech of man. Pliny though would shift the location of the beast from India to Africa. 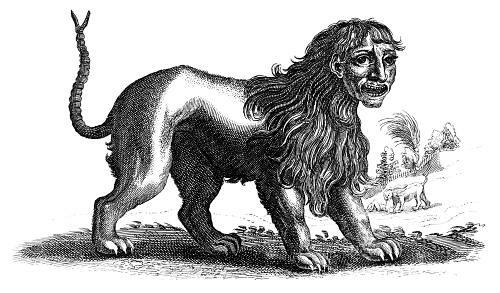 Writers throughout antiquity would retell of the Manticore based on the words of Ctesias, some stating how Ctesias had seen the beast; other writers of the period would dismiss the words of Ctesias, instead linking the Manticore with the tiger of India. Man-eating tigers are of course not unknown, even today, and the evidence for the Manticore being a fantastical version of the tiger is added to by the fact that ancient reports told of the Manticore being a populous beast, and one hunted by Indians from the backs of elephants, something which occurred with tigers write through until the early 20th century.